Listen to Rick Pluta's feature on the 2017 State of the State address. Governor Rick Snyder has set a goal of getting Michigan’s population above 10 million people before the next U.S. Census. It was part of the governor’s seventh State of the State address delivered at the state Capitol. It’s been 10 years since more than 10 million people called Michigan home. Thousands fled the state through two recessions, and the near-collapse of the auto industry. Michigan was the only state in the nation to suffer a net loss of residents in the last Census. That cost the state funding for federal programs, the loss of a seat in Congress, and statistical humiliation. The newest numbers say Michigan is now gaining people, but not at the same pace as other states. But the governor offered no specific plans on how to attract those potential future residents. The governor offered a rosy view of the state’s economic climate – unemployment below 5 percent, incomes on the rise, along with home values. He said that should inspire confidence that Michigan is a good place to live. He said Detroit, for example, has emerged from bankruptcy to become a magnet for young people looking to start careers. But there are very different views on what it would take to make Michigan a place that will attract more people. State House Speaker Tom Leonard (R-DeWitt) says the state’s off to a good start now that the Great Recession is over. For Leonard and the Legislature’s GOP leaders, the answer is tax cuts. He’s pushing for rolling back the state income tax. That’s at the same time that Governor Snyder – who was silent on taxes in his speech -- has called for a multi-million dollar infusion of money into infrastructure. He offered no plans on where the money would come from. State Senator Bert Johnson (D-Detroit) said a serious infrastructure plan would mean changes in how the state’s handled funding for local governments. How the governor intends to pay for infrastructure improvements is the biggest question hanging following the speech. The governor has a budget rollout coming soon that could answer that question. There’s also the issue of Flint, where state blunders helped create the city’s drinking water crisis. 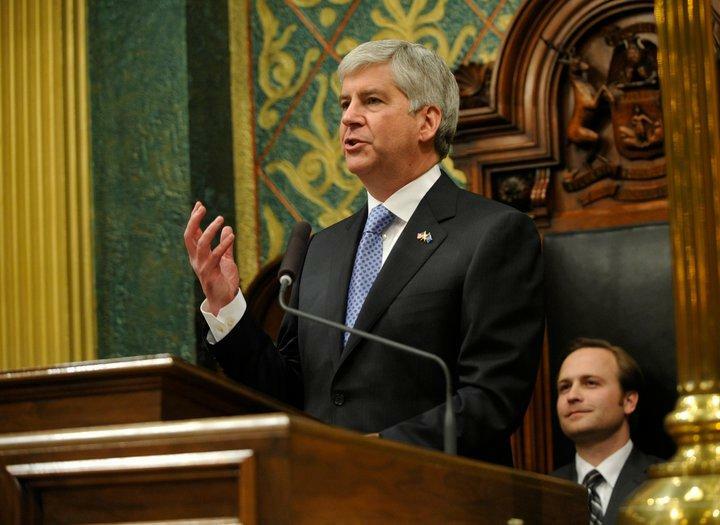 Last year, Governor Snyder devoted nearly half his speech to the Flint water crisis. This year, the controversy rated a couple of minutes and no new plans specifically to help the city. 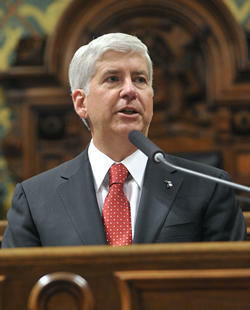 Governor Snyder focused much of the annual address on his achievements as governor, while also, insisting there is more work to be done. Unlike last year, when the Flint water crisis took center stage, this year, Snyder did not address Flint until halfway thru his speech. During the short time he did spend on Flint, he spoke about the work that has been done.